Formax FD 8602CC cross cut shredder is a reliable machine that aims in providing optimal performance to get rid of sensitive information in the safest way. This security level 3 shredder is designed with wide feed opening of 16” and has the ability to take about 37 sheets of paper in a pass. The heat-treated steel cutting blades will shred your papers, clips and staples into tiny cross cut pieces of 5/32” x 1 1/5”. Formax FD 8602CC is equipped with an Auto Start/ Stop function that will sense the papers in the feed opening and start shredding automatically till the last paper has been shredded. The Formax FD 8602CC cross cut shredder has been built with commercial grade components and features that would increase the shredding efficiency to two folds. The LED control panel on top of FD 8602CC paper shredder is easy to use and helps operate the shredder. The shredder is equipped with a number of auto sensors for a much efficient performance. The Auto Reverse and Auto Cleaning functions make sure no jam occurs. In case the shredder is lagging in performance and is not shredding the way it should be, all the user needs to do is press the reverse button on the control panel for five seconds and the motor will run in reverse for a minute clearing it with any stuck debris. FD 8602CC cross cut shredder also supports safety features like an Auto Sensor that informs the user when the waste bin is full. In addition, the Door Safety Sensor makes sure the machine automatically shuts off if the door is left open. The service of this machine is also very easy, as the technician will know of all the important details required through the Self-Diagnosis System in the machine. Formax FD 8502CC cross cut office shredder with its easy to use control panel gives complete authority to operate the machine without any difficulty. Formax FD 8502CC also comes with an Oil Indicator LED that flashes after 4 hours of shredding to remind the user that it’s time to lubricate the blades for top shredding performance. Formax presents the FD 8602CC office shredder. The formax FD 8602CC office crosscut shredder is build to last with its commercial grade features including an all metal cabinet, steel gear, a heavy-duty AC motors and an LED control panel. The FD 8602CC can shred up to 37 sheets in one pass through its 16 inch wide throat. The user-friendly control panel features an LED load indicator to monitor the shredding capacity. 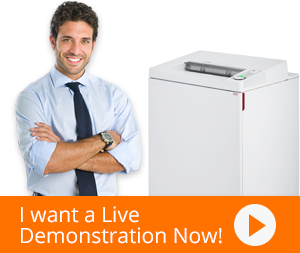 Auto reverse is activated if the shredder is overloaded for easy removal of sheets. The FD 8602CC includes a lifetime guaranteed high-density plastic waste bin as do all Formax office shredders. The FD 8602CC office shredder from Formax.